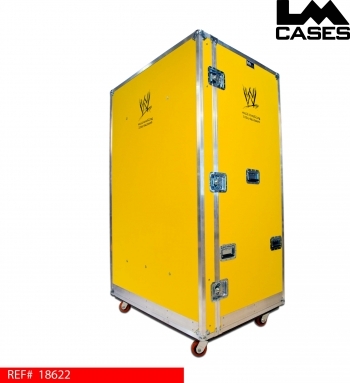 This case was built for World Wrestling Entertainment to hold still photography equipment. The case is built out of 1/2" plywood laminated with yellow ABS plastic, and features 9 drawers mounted on Accuride drawer glides. 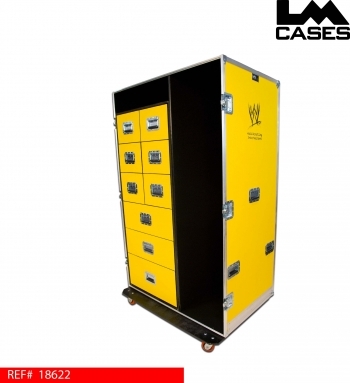 The interior of the case also features 2 large ozite lined accessory compartments. 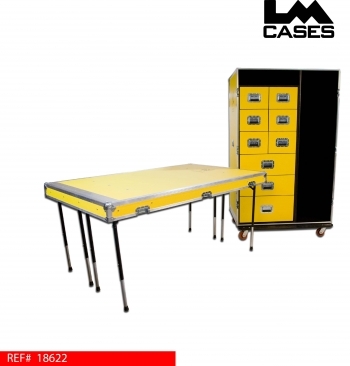 The case lid doubles as a table and features 2 sets of height adjustable table legs. The exterior of the case employs HD 4" x 2" casters, a 1/4" aluminum forklift guard that protects the bottom of the case, and a custom silkscreen of the WWE logo. Special thanks to the WWE!